Happy Flash Friday! How is the New 52 treating you? Today is all about protection. By that I mean using Flash themed merchandise to keep yourself covered. So we’re obviously talking about Flash condo…no not that. I mean I would talk about them if they were out there, but I don't think they are. 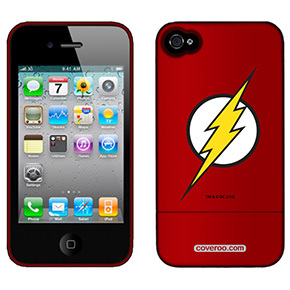 We’re talking about the Flash themed phone cases by Coveroo. A quick look around my office and I see everyone’s phone perched somewhere on their desk. Out of the ten I can see only one of those isn’t wrapped up in some kind of protective case. If we’re going to incase these devices in rubber and plastic, why not decorate it? No, no, don’t get your Bedazzler out. Coveroo is already doing that. The great thing is they don’t just have a Flash option to chose, they have seven! You can get the Flash logo. You can get a few different versions of the Flash running. You can get the Flash standing. My favorite is the simple Flash symbol, but we’ve already talked a lot about how I prefer that over most of the designs when it comes to merchandise. Most of the device options also come in different colors, so you can find a color and design that you prefer. The price is going to change depending on what kind of phone you’re trying to protect. The majority of them were around 30 dollars. 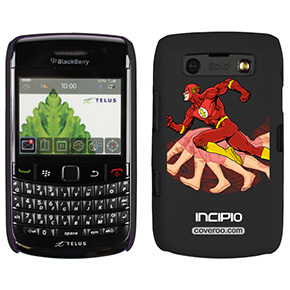 Coveroo offers covers for all sorts of devices. On their site they have sections for iPhone, iPod, iPad, BlackBerry, Kindle, Apple, HTC, Journal, Kodak, LG, Motorola, Nokia, Palm, Samsung, Sanyo, and T-Mobile. They have other superheroes and other licensed properties too, but since this is Flash Friday we’ll just ignore the others. I must say it is kinda funny to see a the word Flash on an IPad cover. He'll be here all night folks. Try the veal and remember to tip your waitstaff!